The 4-H program enjoys a “national home” and focus of its citizenship education right outside of Washington, DC, the center of our country’s democracy. 4-H’ers themselves contributed money to this proposed center but, also, revenue from the National 4-H Calendar Program helped significantly to bring that dream to fruition. 1949 National 4-H Calendar produced by Brown & Bigelow Co.
Long ago, when calendars were first sold to local businesses for advertisement, 4-H was approached by national calendar companies to appear on calendars, and the six-decade National 4-H Calendar Program began. 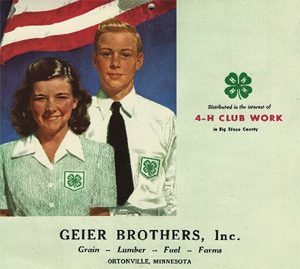 For use of the 4-H name and emblem, companies paid a 10% royalty on sales of 4-H calendars to be used for the development of the National 4-H Center. During the first decade, between 1949 and 1959, $377,000. was made available for the rebuilding and maintenance of the 4-H Center in Chevy Chase, Maryland. Establish a royalty fund to assist in further development of the 4-H program. 1949 National 4-H Calendar by Thos.D. Murphy Co.
Year three – calendars are presented to local businesses who purchased the calendars as gifts to their customers. The Brown & Bigelow 4-H calendars had a circulation of nearly a half million the first year and combined calendar sales exceeding a million and a half by the second year. The first year’s royalties were over $25,000. In addition to Brown & Bigelow and the Murphy Company, other calendar companies joined the National 4-H Calendar Program producing different annual calendars in their respective print shops. Shaw-Barton, Inc., Coshocton, Ohio, was authorized to manufacture 4-H calendars on April 15, 1948; Gerlach-Barklow Co., Joliet, Illinois, authorized on July 23, 1946; Gettier-Montanye, Inc., Glyndon, Maryland, authorized on February 3, 1947; and Custom-Cal Co., Atlanta, Georgia, authorized on December 17, 1954. We are always looking for more images of these historic calendars, so if you have one or know someone who has one, please let us know at: Info@4hHistoryPreservation.com . Next time you visit the National 4-H Conference Center, check the Heritage Hallway to see the original pieces of art; truly pieces of Americana. 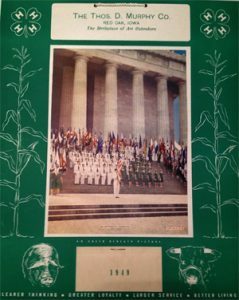 As you walk that Hallway, recall that those national 4-H calendars helped build the “national home” of 4-H.